The 'UNESCO' Heritage site and natural wonder that is 'The Giants Causeway' is an absolute must see on your Irish vacation. At Elegant Irish Tours, we have developed a fantastic itinerary which allows you to experience this incredible site in combination with some of the area's best highlights - spaced out over the course of a two-day tour. Our route takes us along the Glens of Antrim, with places of interest along the way including Belfast City and the 'Titanic Experience', Monasterboice ancient Monastic settlement and Dunluce Castle. Your luxury vehicle and expert tour guide will collect you at your chosen Dublin location - it's then time for your luxury 'Elegant Irish' experience to begin. 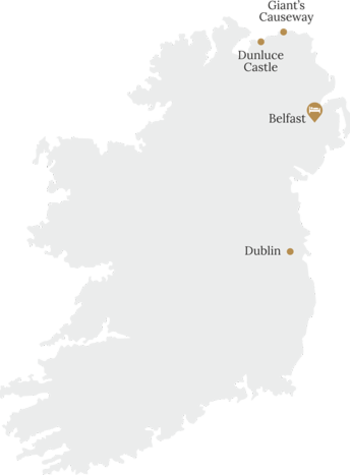 We depart Dublin for Belfast, making a stop at the beautiful 'Monasterboice' early Christian settlement, where you can marvel at the early Celtic crosses and haunting ruins, which are surrounded by beautiful countryside. We'll then continue our drive towards Belfast - arriving in the city through the ancient and recently regenerated 'docklands' district. This little quarter of the city is where the ill-fated RMS Titanic was constructed, prior to its final departure in 1912. A fantastic new exhibition ('The Titanic Experience') was opened recently to commemorate the centenary of the ship's catastrophic demise in the Northern Atlantic. The experience contains a number of interactive exhibits, which account the fascinating history of the ship - it is an attraction not to be missed! Arriving into Belfast city center - there are a huge selection of highlights not to be missed. Your guide will be happy to recommend some of the best highlights for you to experience during your time here. One experience, which comes highly recommended is the 'Black Taxi' tour of Belfast. Few people are unaware of the colourful and often troubled political past of Belfast. This tour, which takes place in a traditional Belfast taxi, takes you thorough the city's past and gives insightful accounts into how the city has overcome its troubles to become the cosmopolitan and thriving city that exists today. Enjoy an overnight stay in Belfast, where you can enjoy a delicious local dinner, a pint in the historic 'Crown Liquor Saloon' and a fantastic evening of Belfast nightlife. After a leisurely morning in Belfast and a hearty breakfast - it's time to begin another fun-packed day of exploring Ireland's north coast. We'll depart Belfast and enjoy a truly scenic drive north along the 'Glens of Antrim'. En route, we make a short stop at the charming small town of Ballintoy - where our bravest guests can enjoy a crossing of the ancient 'Carrick-A-Rede' rope bridge. Whether or not you decide to cross - there are stunning views for you to take in. Stretch your legs and enjoy the fresh sea air, before we continue our drive. Reaching the very north coast of Ireland - it's time for the highlight of our tour - the 'Giants Causeway' itself. The Causeway is a stunning display of thousands of hexagonal basalt columns. Scientists claim that the causeway was formed millions of years ago by volcanic activity. However, ancient legend argues that the causeway was constructed by mythological hero Finn McCool, as a location for his battle with Scottish giant Bennandonner. Decide which account you will believe as you stroll along this fascinating local wonder. A state-of-the-art visitor experience has recently been opened to exhibit the site's history and the center also houses a beautiful gift outlet for you to peruse. Departing the Causeway, we'll have time for one more highlight before beginning our return drive to Dublin. Our final stop is at the historic ruins of Dunluce castle. The castle has long been rumoured to be haunted and enjoys an interesting history – including the loss of some of its exterior walls, which, decayed and fell over the cliffs and into the ocean a few hundred years ago! Your guide will fill you in on the history of the region and you'll have time to capture some photos of the ruins. With a fantastic tour of the Giant's Causeway and highlights of Norther Ireland, complete it's time to relax in your luxury vehicle for your return transfer to Dublin City.